I just love the creamy rich taste of a cheesecake. 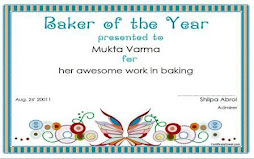 To make the baked version has been on my wishlist since a long long time but just could not get around to making one. Finding the imported cream cheese, earlier available only in some gourmet stores, too exorbitantly priced for a mere experiment, has also been a major reason that has deterred me from trying out this wonderful dessert. I did try out the no-bake version (which is my absolute favorite for a quick-fix dessert) of the cheesecake, even though it tasted absolutely fabulous, I did not get the same satisfaction as somehow at the back of my mind I had this nagging feeling that it wasn't the "real" thing!! So the other day, while walking through a grocery store in one of the malls in Gurgaon, I was pleasantly surprised to spot a tub of cream cheese by our very own Indian brand "Brittania" and that too at such a reasonable price (Rs.150 for 180gms). Yipee!! Finally I get to make my baked cheesecake!! As they say "good things come in small packages", I too tried out the mini version of the cheesecakes. Jokes apart, in my excitement of buying the cream cheese, I forgot to check the label for the quantity. As 1 tub of cream cheese had only 180 gms, I did not have enough to make a big sized cheesecake, so I decided to try out these mini versions of the cheesecake. After baking, be sure to cool the cake for an hour before putting it in the refrigerator for at least 4 hours, if not overnight, prior to serving. Topped with whipped cream and fresh strawberries I can vouch that it was by far the most delicious cheesecake I have ever tasted and No! it is definitely not a case of love-your own-recipe. Try it out!! and I am sure you too would fall in love with this easy-to-make, melt-in-the-mouth heavenly cheesecake. Combine the strawberry crush and the cornflour in a saucepan. Boil and stir till the sauce is thick and shiny. Set aside to cool. Combine the biscuit crumbs, cinnamon and melted butter in a bowl. Measure a rounded tablespoon of the mixture into the bottom of a cupcake liner, pressing firmly. Refrigerate for 30 minutes. Alternately, if you are feeling a little adventurous and want that wow effect, press the crumbs into a ring mold and chill well. Put a layer of sliced strawberries around the edges. Beat together the cream cheese, lemon juice, egg yolks and vanilla essence in a mixing bowl with an electric mixer until light and fluffy. Gradually beat in the condensed milk. In a separate bowl, whisk the egg whites till stiff. Now gently fold in the egg whites into the cream cheese mixture. Spoon the mixture into the cupcake liners, filling each 3/4th full. Warning: I know at this point you will be highly tempted to polish off your wonderful creation but wait!! If you are able to resist, cool them completely and refrigerate for at least 4 hours before digging in. Believe me they do taste better after cooling. Definitely worth the wait!! 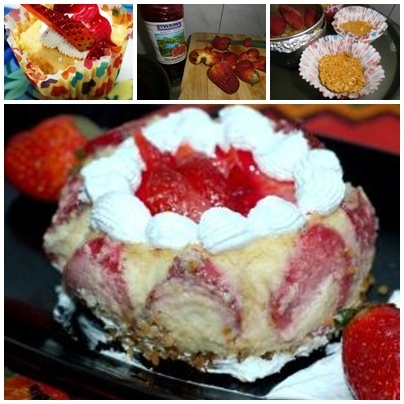 Enjoy topped with strawberry sauce and whipped cream. Wow! so soft and divineful cake. Tiene un aspecto muy bueno me encanta ,hugas, hugs.